I am a serious and notorious over-packer. In the past, there was almost never a time where I didn’t end up bringing more “stuff” with me than I needed. Being both a makeup and skincare junkie doesn’t help, of course. For the past couple of years, I’ve been trying very hard to curb my beauty spending (you can read more about it in this post). It’s been a while since I went on the “Beauty Diet” and I’m happy to say that I’ve been pretty much sticking to my goals and don’t buy (or carry/bring) as much beauty products as I once used to. When packing for my trip to Europe last month, I sat down to pack up and make a list of all beauty products I wanted to bring with me, I couldn’t help but feel a little anxious. Also, overwhelmed. Thankfully, I know exactly how my skin reacts to lack of sleep, change in my diet and sudden weather/climate changes. 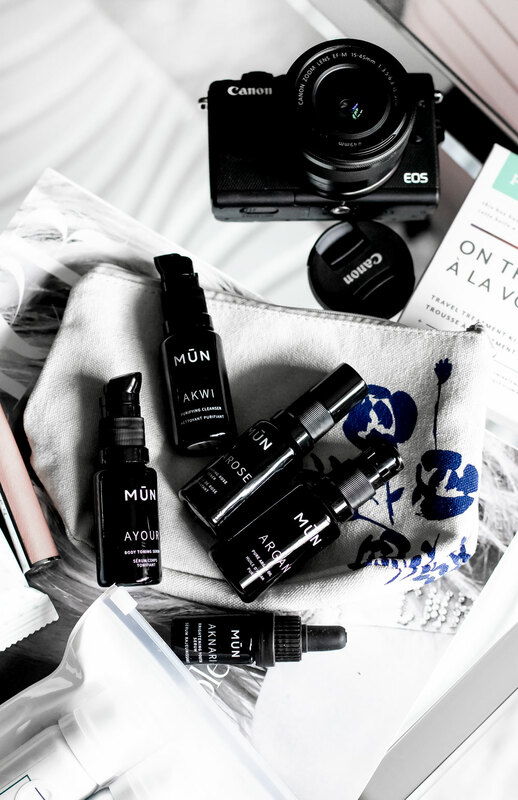 Traveling isn’t the best time to try new products or deciding on using up those samples you’ve been stashing forever. My advice is that you stick to what you know your skin likes and plays nice with. I also always make sure to bring my supplements with me- my skin goes crazy if I go even 2 days without my Omega3 supplements. Sheet masks and hydrogels can be a life-saver for your skin while you’re traveling- whether it be a road trip or a 7-hour flight. It’s no secret that I’m a huge fan of Patchology and both their hydrogels and sheet masks are easy to use and completely mess-free, so they’re great to reach for while you’re traveling. This On The Fly Multi-Masking Skincare Kit* has got you covered with sheet masks and eye + lip hydrogels. My love for their products is real, mostly because not only are they effective, they work quickly and are great to use on the go. Even though my skin is prone to acne, it always gets dry whenever I travel or don’t get enough sleep (and both of these often go together, actually). 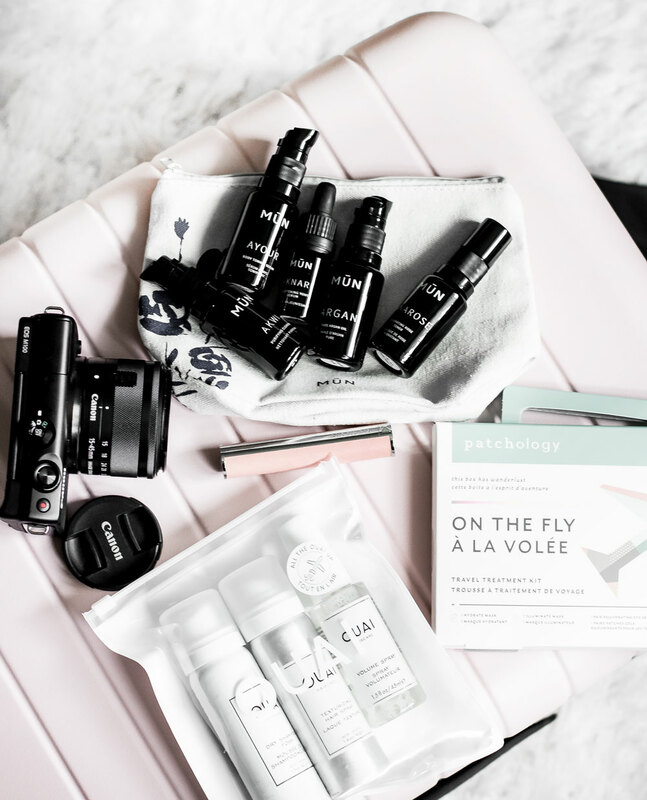 The Akwi Cleanser is incredible for both dry and sensitive skin and even when you’re washing your face on the plane, it transforms such a simple task into an indulgent, spa-like experience. You already know how much I love it because I talked about it at length in my acne-related posts. While I’m not too picky when it comes to shampoo and conditioner, it’s a bit of a different story when it comes to styling products. I usually just purchase these little containers and bring whatever shampoo + conditioner combo I’m using at the moment (right now it’s Saints and Sinners Velvet Divine* collection). 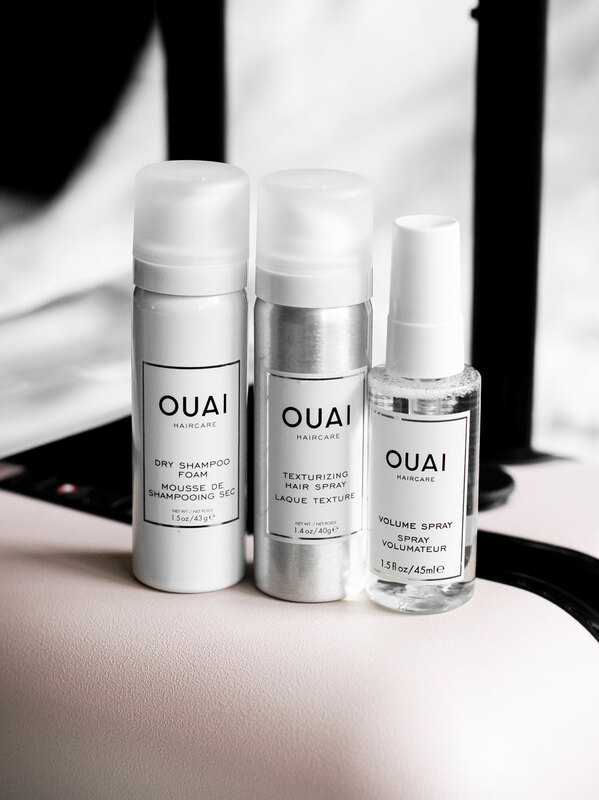 Ouai is one of the haircare brands that’s been working great with my short hair. Their travel kit is one of my favorite little sets. First, it’s TSA-friendly. Second, this set has pretty much everything you need to refresh your hair after a long trip. The set comes with a Dry Shampoo Foam, Volume Spray, and a Texturizing Hair Spray. If there is one beauty product I never travel without, it’s the good old Cetaphil Cream. My skin always gets severely dehydrated and this thick but non-greasy formula always works miracles does miracles to my skin. A few weeks ago I celebrated my birthday and as a special treat to myself, I bought a jar of Creme de La Mer, in hopes that it would be even better than my beloved Cetaphil in a tub. I’ve been wanting to try Creme de La Mer for years, but $170.00 and a week later, I experienced my first post-Accutane breakout. It wasn’t pretty. This just goes to prove that pricey doesn’t always equal better. A thick layer of Cetaphil Cream always leaves my skin feeling more hydrated and healthy. I also use it to buffer both Retin-A Micro and Tazorac. Cetaphil in a tub is hands down one of my favorite drugstore products of all time. It’s also thick enough to use it all over your body, not just your face, which is a bonus. Traveling during warmer months means more shaving/waxing than usual and Amlactin always helps me with both ingrown hair and dry and patchy skin. My derm actually recommended it to me when I asked her about my dark underarms- and hello, it wors for that, too. It’s formulated with AHA, so it definitely makes sense that it will help brighten the skin. It doesn’t get better than Elizabeth Arden’s 8 Hour Cream, Lano Lips and Givenchy’s Le Rouge Perfecto Beautifying Lip Balm. They’re all intense and hydrating treatments that work great with chronically dry lips, which tend to get even drier when traveling. Products like makeup removing wipes are always a big “no” in my book because they tend to irritate my already sensitive skin. Tazorac- a prescription acne cream- is also a trusty travel companion, just in case I experience a sudden breakout. I also tend to get cold sores quite often when experiencing sudden temperature and climate changes- yup, having weirdly sensitive and picky skin is no fun at all! I’ve tried pretty much every single OTC product, and none have worked as well as prescription Denavir. Needless to say, I never travel without it. When your skin as picky as mine, it’s all about being prepared for every possible scenario! I often wish I could bring my entire bathroom and makeup collection with me when traveling. What are some of your must-have travel beauty bits?